WRT manufactures treatment equipment in a variety of sizes and configurations to address virtually any flow rate or contaminant removal criteria. 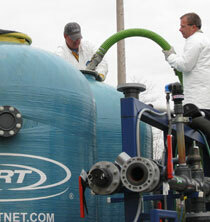 WRT can provide everything you need for clean, safe water from reliable process equipment and services to the assurance of radiation safety and the environmentally sound removal and disposition of treatment residuals.WRT will evaluate and analyze your site-specific application and recommend the most cost-efficient treatment solution. Need recommendations for your treatment application? Contact us.